Fair Warning: When you are shopping, please make sure buy merchandise from the original seller "Felicity Young". If you cannot find "Felicity Young", please click button New to choose "Felicity Young"/ We are not using amazon size chart, please check the size information at pictures and at "Product Description" before you place the order. A stretchy slim fit bodycon dress with exquisite embroidery pattern design helps to create an illusion for stunning curves. Suitable Party ,Office,Casual, Spring, Summer, Fall and Winter. This elegant yet flashy dress helps you to look amazing when wearing it out to a cocktail party, evening event, wedding or any special occasions. Love this dress! 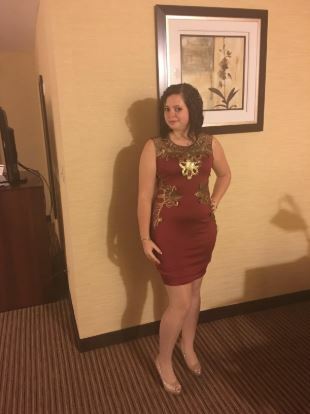 Wore it for new years and it fits true to size. Im 5'6 and 155 and a medium fit perfectly, its a bit strechy but it also hugs all around( not skin tight).